Gwendolynne “Gwen” Moore was born on April 18, 1951 in Racine, Wisconsin. After earning a BA in political science from Marquette University in 1978, she served as a VISTA volunteer and helped launch a new community credit union—earning, in the process, a national “VISTA Volunteer of the Decade” award for 1976-86. She also worked variously for Milwaukee City Development, the Wisconsin Housing and Economic Development Authority, and the Wisconsin Department of Employment Relations, Health, and Social Services. Moore launched her political career in 1989, when she began a four-year stint in the Wisconsin State Assembly. She then served in the Wisconsin State Senate from 1993-2004. Her 1996 campaign was backed by the New Party, a socialist political coalition that counted Illinois state senator Barack Obama among its members. In 2004 Moore was elected to the U.S House of Representatives (representing Wisconsin’s 4th Congressional District), and she has held that seat ever since. Planned Parenthood, EMILY’s List, and J Street have been among her most stalwart supporters. When the House of Representatives voted by a 345-75 margin to defund the notoriously corrupt community organization ACORN in September 2009, Moore was one of the 75—all Democrats—who voted to continue funding the group. On January 27, 2010, Moore was one of 54 Members of Congress who signed a letter calling on President Barack Obama to pressure Israel to end its blockade of Gaza—a blockade that had been imposed in order to prevent Hamas from importing weaponry from Iran and Syria. In May 2015, the Washington Post reported that Moore was planning to raise funds for her political campaign by charging potential donors $2,500 for the privilege of sitting next to her at an upcoming Taylor Swift concert at Nationals Park in Washington, D.C. — an event for which standard ticket prices ranged between $54.50 and $134.50. In March 2017, Moore introduced a congressional bill titled the “No Taxpayer Funding for the Wall Act” designed to prohibit any federal funding for the construction of a wall or barrier along the U.S.-Mexico border. “I am not in favor of the wall, but if there is a wall, then I do not want the United States of America to pay for the wall,” Moore said in an interview with CBS News. When the Daily Caller in February 2018 contacted Moore and a number of her fellow Congressional Black Caucus members to ask if they would be willing to publicly denounce the notorious Nation of Islam leader Louis Farrakhan, Moore was one of 20 who declined not only to denounce him, but also to issue any comment at all regarding his infamous anti-Semitic, anti-white rhetoric. For an overview of Rep. Moore’s overall voting record on a variety of key issues, click here. For additional information on Gwen Moore, click here. Further Reading: “Gwen Moore” (Votesmart.org, KeyWiki.org); “Republicans Aim to Ban Use of Welfare Debit Cards at Strip Clubs, Liquor Stores” (Huffington Post, 2-1-2012); “Democratic Rep. Claims Victimizing Women Is As ‘American as Apple Pie’” (TheBlaze.com, 5-26-2012); “Congressional Black Caucus Chair Accuses John McCain of ‘Racism and Sexism’” (re: Susan Rice, CNS News, 11-16-2012); “Rep. Moore: GOP Demands ‘That You Work Else Your Children Can’t Eat’” (CNS News, 6-25-2013); “Dem Rep. Gwen Moore Attacks Hobby Lobby” (Gateway Pundit, 11-27-2013); “$174K Salaried Dem ‘Saving My Pennies’ for Fine in Wage Inequality Protest” (CNS News, 9-5-2014); “Congressional Black Caucus on Verdict: ‘Black Lives Hold No Value’” (re: Michael Brown case, Newsmax.com, 11-25-2014); “Members of Congress Charge $2,500 to Sit with Them at a Taylor Swift Concert” (Washington Post, 5-8-2015); “Black Congresswoman Calls White Congressman Racist Because He’s Upset Black Babies Are Aborted” (LifeNews.com, 1-11-2016); “Dem Rep Moves to Block Funding for Border Wall” (Daily Caller, 3-9-2017); “Black Caucus Members Refuse to Denounce Hate Group Leader Louis Farrakhan” (Daily Caller, 2-7-2018); “Rep. 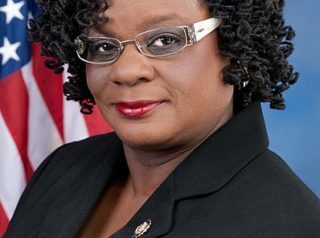 Gwen Moore: Trump Should Resign, Leave Office in ‘Dignified Way’” (Breitbart.com, 12-28-2018).